Scrangie: Chanel Haute Chocolat: Meh. This is a polish that I was pretty excited about, despite my vow to not spend any more money on Chanel nail polish. It's brown! It's sparkly! Ooh, aah! How perfect! At least, that is, until I put it on. It looks so sparkly and delicious in the bottle, but on my nails it falls flat. It doesn't look like it does in the bottle. It just looks like weird brown with dust on it. The formula is consistent with the other Chanel polishes I have (besides the Robertson ones which were a nightmare)- a little on the thick side, but otherwise decent. It applied well, dried quickly, all that good stuff. Chanel polishes usually chip the same day for me, but I didn't leave this on long enough to find out. I may even be the only one who isn't impressed by this color, as I've heard nothing but rave reviews of it. Call me crazy- I don't think this is anything special. As much as I wanted to love it, and as much as I hoped it would look like it did in the bottle, I just can't convince myself that I'm happy with it. I'm disappointed, that's all. Which brings me to this thought- this is another $20 (or was this one $25? I can't remember) nail polish that I don't love. I can't afford to keep buying $20 nail polishes that I'll probably never wear. There are a few Chanel polishes that I *love*- Kaleidoscope, Azure, Gold Fiction, the ever-elusive Cobra which I don't own but have lusted after ever since I first saw it- but how many more Chanel polishes have I purchased that have been a total disappointment? So, my opinion on this? Chanel Haute Chocolat- sure, it's a nice color, whatever, ho-hum. You would be better off buying China Glaze Prize Winning Mare. While the two colors aren't matches, Prize Winning Mare definitely satisfies my craving for a sparkly, dimensional earth-toned polish, while Haute Chocolat leaves me wanting more. Gosh on my monitor it looks really dark on you. I find it milkier on me. Scrangie, could not agree with you more! I also found this to be beautiful in the bottle but flat and boring on me. It is also chiptastic and chips on me the same day just like other Chanel's. Yet for some reason I keep buying them.... junk. Must stop. I figured it was because my skin color was too dark for it (I'm Filipina)...wow, I'm glad I'm not the only person who was kinda disappointed when I got Haute Chocolat. However, I've never had a problem with my beloved Kaleidoscope...that bottle may be going to the grave with me along with Extravagance. Wow, in your photo Scrangie, Chanel HC looks way darker than in Steph's Closet's photo (26 October 2008). Could Chanel's batches of HC polish be of inconsistent quality? Steph compares Chanel HC, and the much less expensive Sally Hansen's HC and The Good Earth, so I bought The Good Earth and it goes well with my conservative brown-based office suiting. Thanks Scrangie for all the swatches! Really helps me with purchase decisions. While I do love Chanel polish in general, I really need it to scream out to me. Gold Fiction and Kaleidoscope certainly did the job. I agree with your assessment about the polishes being on the thick side. For me, it's a plus since I tend to do thin coats. I don't use Seche, so I wonder if the chipping people report is an incompatibility with Seche. I put my Chanels in a CND Stickey Sandwich with CND Super Shiney on top and Use OPI Drip Dry Drops. Brown is a color I enjoy, but it's neither green nor purple nor metallic...so it's not a screamer. I also have Sally Hansen's The Good Earth in my untested pile along with CND's Cuppa Joe and OPI's Espresso Your Style. I can probably do without in this case. Almost anything compared to the Rodeo Diva collection will come up looking a little sad. LOL. I think it looks beautiful on you (what doesn't), but I completely hear you on this one. I own it and like it, far from love it though. Chanel should just stop making new colors and bring back the oldies but FABBIES!!! Who wouldn't love Night Sky, Cobra, Vert Sacriledge, Ruby Slipper, or Very Vamp just to name a few???? u have revived my gold fiction lemming! I don't buy Chanel polishes because of the poor quality for the dollar, and I really don't think I am missing out. RBL and Lippman put out better products for the same price, or even a bit less. Thanks for confirming my thoughts on this one! I completely agree with you, 100%. I was VERY disappointed with this one :( I had such high hopes seeing the bottle but it was so dull on my nails. OPI My Private Jet (version 1)! i still want this because i have a new found love for browns but i can't bring myself to splurge on it. I tried this on at Saks but it looked like crap on me (literally). I don't own any Chanels yet and I probably won't due to how much they cost. I just can't bring myself to spend that much for something I'm pretty sure (though it may require some searching) a dupe of. Your nails, however, are GORGEOUS!! I'm wondering if there might be different batches of it. I love it, the gold flecks really stand out and it is not at all thick to apply. But, I do have a problem with Chanel polishes and chipping. With Seche Vite I get about 2 days without a chip. Thank you! One polish cut from my list of lemmings! yay! HC looks so much darker on you than on me! ON me it's a neutral brown with very visible gold microshimmer...I love it! I too am constantly disappointed with chanel polishes, I own lots of them and really love some of the colours, like kaledoscope, marilyn and fire but they too chip the same day so are not worth it. Plus I've found almost exact dupes for some of my colours from essie, a-list is dupe of fire, wicked is a dupe of rouge noir, polish addict showed that steeling the scene was a good dupe for kaleidoscope. Essies last ages on me and are half the price of chanel! I always vow not to buy anymore chanel but I just can't resist, damn this nail polish obsession! I was considering purchasing haute chocolat but since seeing your pics and reading your review I am no longer lemming it. Thankyou for stopping me from wasting my money! SiennaX, thank you! And YES!!! That's the most amazing idea ever, I wonder if Chanel would listen to some consumer input?? All those old colors are way better than anything they've released recently! Polish Lover, that could be the case. I really liked it in other people's pictures, but it doesn't look the same on me. Very strange! Wixbetty, I have two bottles of My Private Jet which are different, but I haven't seen the flat brown one, I've been looking for it so I can compare! I'm very, very curious about this as well! Sara, I totally understand. I think it's a love it or hate it color- and I used to be firmly planted in the 'hate it' group! I'm not sure what changed my mind, but now I love it! I was intrigued by Chanel Haute Chocolat when I first heard about it, glad I didn't buy it. 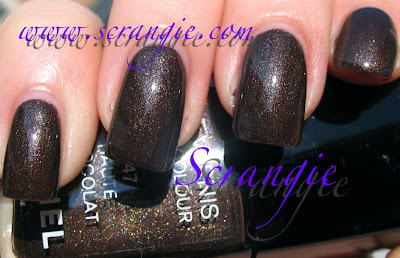 I love my Sally Hansen Haute Chocolate, even though its a very different color! Scrangie, have you ever posted any pictures of your polish collection? I can't imagine how many you must have! How do you store them all? I'm not very organized when it comes to my beauty stash, so I love seeing how other people organize theirs. Thanks so much for your swatches and your honest opinion. When I first saw pictures of the color, I was like OMG GOTTA HAVE. Thanks to your blog, looks like I'll be saving some money! LOL Thanks as always. OMG your stash takes up an entire room?? I would probably die from joy if I ever saw it in person. I would love you see it if you have time to give us a photo tour of it! And please post pics of your treasure cave of polish, Scrangie!! So even if we think that the Chanel is sorta kinda maybe like CNY Spanish Harlem crossed with OPI Espresso Your Style, but without the charm of either, clearly ... WE ARE WRONG. I don't know why you say that it's meh; i think it looks great on you and I may be one of the few but i LOVE mine and always get great compliments when I wear it. Any who, thanks for the post! I totally agree with you Scrangie. I bought it, brought it home and then returned it in two days. Flat and blah, and it looked like dirt on me. Meh. Actually, I didn't even find it that pretty in the bottle. Usually the color winners make pretty spectacular nail polish colors, but this was blah for me. Gaah but I love it on you! I just bought Essie Decadent Diva and I think it's a more vibrant version of this brown. It's a more wine colored brown and still has that lovely sparkly depth. got a wonderful compliment on it today too. Tifflet, I wish that it looked like it does in the bottle! *sigh* Oh, Chanel, you're so tricky. That comment about a new MPJ intrigues me! Great blog, btw - I just stumbled on it! Makeupmag, thank you so much :) My Private Jet is one of the best colors ever created! *sigh* FINALLY someone that agrees with me. Its not that original. I've tried to love it but I just can't. Looks like a hobo's turd that has eaten glitter a few meals ago.